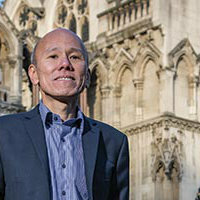 Andrew joined The City Law School as Professor of Law in November 2012. Prior to his appointment at City, he held professorships of law at Brunel University and the University of Warwick, and, earlier, appointments at the University of Leicester and the University of New South Wales. His research interests include evidence and procedure, especially criminal evidence. His published work has been cited in decisions of various appellate courts, including the House of Lords, the UK Supreme Court, the Privy Council, the Supreme Court of Canada, the High Court of Australia and the New Zealand Supreme Court. How should a modern criminal justice system handle the guilty plea discount? Choo, A. (2018). Evidence. Oxford: Oxford University Press. ISBN 978-0-19-880684-4. Choo, A. (2015). Evidence. Oxford: Oxford University Press. ISBN 978-0-19-870527-7. Choo, A. (2013). The Privilege against Self-Incrimination and Criminal Justice. Oxford: Hart. ISBN 978-1-84113-317-1. Choo, A. (2012). Evidence. Oxford University Press. ISBN 978-0-19-960115-8. Choo, A. (2009). Evidence. Oxford: Oxford University Press. ISBN 978-0-19-923974-0. Choo, A.L.T. (2008). Abuse of Process and Judicial Stays of Criminal Proceedings. Oxford University Press, USA. ISBN 978-0-19-928083-4. Choo, A. (2017). A Question of ‘Desirability’: Balancing and Improperly Obtained Evidence in Comparative Perspective. In Roberts, A. and Gans, J. (Eds. ), Critical Perspectives on the Uniform Evidence Law Federation Press. ISBN 978-1-76002-136-8. Choo, A. (2016). Abuse of Process and Delayed Prosecutions. In Radcliffe, P., Gudjonsson, G.H., Heaton-Armstrong, A. and Wolchover, D. (Eds. ), Witness Testimony in Sexual Cases: Evidential, Investigative and Scientific Perspectives Oxford University Press. ISBN 978-0-19-967293-6. Choo, A. (2013). England and Wales: Fair Trial Analysis and the Presumed Admissibility of Physical Evidence. In Thaman, S.C. (Ed. ), Exclusionary Rules in Comparative Law (pp. 331–354). New York: Springer. Choo, A. (2012). Give Us What You Have: Information, Compulsion and the Privilege against Self-Incrimination as a Human Right. In Roberts, P. and Hunter, J. (Eds. ), Criminal Evidence and Human Rights: Reimagining Common Law Procedural Traditions Oxford: Hart. Choo, A. (2012). Chapters 12, 13, 14 and 15. In Emmerson, B., Ashworth, A. and Macdonald, A. (Eds. ), Human Rights and Criminal Justice London: Sweet & Maxwell. ISBN 978-1-84703-911-8. Choo, A. Case Comment: R v Horncastle  UKSC 14 (http://ukscblog.com/case-comment-r-v-horncastle-2009-uksc-14/). Choo, A.L.T. and Hunter, J. (2018). Gender discrimination and juries in the 20th century: Judging women judging men. International Journal of Evidence and Proof, 22(3), pp. 192–217. doi:10.1177/1365712718782990 . Choo, A. (2015). EVIDENCE, (IN)EFFICIENCY, AND FREEDOM OF PROOF: A PERSPECTIVE FROM ENGLAND AND WALES. Alabama Law Review, 66(3), pp. 493–505. Choo, A. (2013). Criminal Hearsay in England and Wales: Pragmatism, Comparativism, and Human Rights. Canadian Criminal Law Review, 17, pp. 227–252. Ormerod, DC, , Choo, A.L.-.T. and Easter, R.L. (2010). The "witness anonymity" and "investigation anonymity" provisions. Criminal Law Review, (5), pp. 368–388. CHOO, A.L.T. (1995). HALTING CRIMINAL PROSECUTIONS - THE ABUSE OF PROCESS DOCTRINE REVISITED. CRIMINAL LAW REVIEW pp. 864–874. Choo, A.L. (1994). International Kidnapping, Disguised Extradition and Abuse of Process. The Modern Law Review, 57(4), pp. 626–635. doi:10.1111/j.1468-2230.1994.tb01964.x . CHOO, A.L.T. (1993). REFORM OF EVIDENCE LAW IN AUSTRALIA. CRIMINAL LAW REVIEW pp. 268–271. CHOO, A.L.T. (1993). THE NOTION OF RELEVANCE AND DEFENSE EVIDENCE. CRIMINAL LAW REVIEW pp. 114–126. Choo, A.L.T. (1993). Criminal hearsay in Canada. The Cambridge Law Journal, 52(2), pp. 231–233. doi:10.1017/S0008197300095131 . CHOO, A.L.T. (1992). THE CONSEQUENCES OF ILLEGAL EXTRADITION. CRIMINAL LAW REVIEW pp. 490–495. Choo, A.L.T. (1992). Entrapment And Section 78 Of Pace. The Cambridge Law Journal, 51(2), pp. 236–238. doi:10.1017/S0008197300095544 . CHOO, A.L.T. (1991). CONFESSIONS AND CORROBORATION - A COMPARATIVE PERSPECTIVE. CRIMINAL LAW REVIEW pp. 867–877. Choo, A. (1990). A Defence of Entrapment. The Modern Law Review, 53(4), pp. 453–471. doi:10.1111/j.1468-2230.1990.tb02828.x . Choo, A.L. (1989). Improperly obtained evidence: a reconsideration. Legal Studies, 9(3), pp. 261–283. doi:10.1111/j.1748-121X.1989.tb00650.x . Choo, A. Book Review: Scottish Criminal Evidence Law. Criminal Law Review -London-, 2018(7). Member, editorial board, International Journal of Evidence and Proof.